As is typically the case, there wasn’t much going on Saturday night on network television, especially in terms of original programming. NBC’s cancelled Outlaw said goodbye with the court drama’s last original episode. The all-important 18-49 demographic was up by 25% but it was still in a distant fourth place for the timeslot. 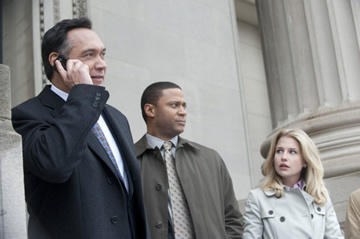 NBC’s not regretting cancelling Jimmy Smits and company. On FOX, Cops was in first place for the timeslot, even beating out football coverage on ABC. The reality series is cheap to produce and 8:30 repeats actually outperform original installments at 8pm. America’s Most Wanted was down by 13.3% but still won the timeslot. Over on CBS, 48 Hours was also down by 13% over last week’s episode but was first in the 10pm hour. What do you think? Will you miss Outlaw? Are you sorry that it’s gone? What were you watching? I am hoping NBC reconsiders, and brings The Outlaw back. There seems to be many viewer petitions and comments to bring it back. I am sure there is an available evening time slot. The Outlaw really deserves another chance. I don’t understand why you canceled a great program like Outlaw. I DVR’ed it every week and was devastated when my DVR crashed and I went to set my recordings up and I couldn’t find it.